As we began our ascent into Albuquerque for our Annual Anniversary Nomad and Nomadess Extravaganza Celebration, I was already enchanted with the desert from 20,000 feet. We had fallen in love with the great Southwest some years earlier when we had purchased land in an unknown corner of southwestern Utah near Kanab, about three hours from Las Vegas - not an enchanted land, city or anything else at all! We both grew up in North Florida which has enough heat and humidity to drive all of the annoying tourists that venture down the interstates to Disney and other Central Florida attractions back to their hometowns in Poughkeepsie and Cleveland. We Floridians refer to our summers as baseball weather. A close friend recently returned from Phoenix to my home town, Tallahassee, for a visit, after some time away. When I picked him up at the airport he observed that he knew he was in Tallahassee when he stepped off the plane and all of the air was sucked out of his body. One of the great things about travel is the change from our day to day to a new environment, weather wise and otherwise, even if for a short while. 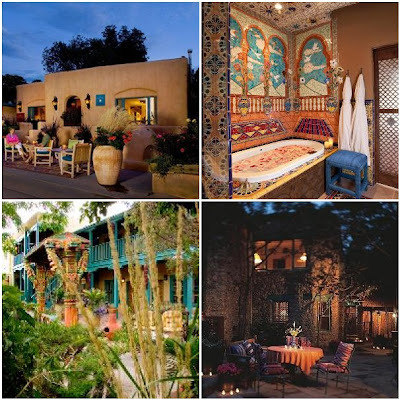 And since we were visiting the "Land of Enchantment" for the first time, we were both filled with excitement to see what the great southwest, the storied Santa Fe and surrounds had to offer. One of the attributes of this great country is its diversity. Geography, culture, food, people. From Miami to Seattle to San Diego to Maine, no country possesses so many different ways for people to enjoy travel and experience different aspects of the melting pot that is the USA. Santa Fe and New Mexico are at the top of the Nomad's list when it comes to travel that is unique, regional and, as yet, not taken over by the banality of "tourist" oriented travel. The Turquoise Trail (Highway 14) takes you the forty five minutes from Albuquerque to Santa Fe through several small, off the beaten path towns and some of the most beautiful desert you will ever see. And the mountains really are purple. As we pulled into the small parking area just off the central plaza of New Mexico's capital city, I was struck by this "real" town of southwestern adobe architecture, its small streets and color everywhere. Best of all, this unique place has a population of only 67,000! Any time you happen on a town that small with an international reputation for interesting culture, great food, fabulous art and amazing history, you have, indeed, landed in a place that any Romantic Nomad can drop anchor. And the beds! Simply put, the beds are the most comfortable I have EVER slept in. 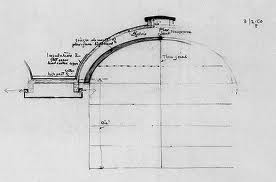 At one time, you could purchase the "sleep system" used by the inn for a princely sum. It is clear that the inn is dedicated to the proposition that no expense should be spared to ensure your ultimate comfort when you retire for the evening. And what better way to enjoy the most comfortable beds on earth than to be surrounded by highly detailed and exotic headboards and fine Egyptian cotton sheets finished off with one of a kind comforters and afghan blankets of intricate designs in blazing colors? After a couple of days at this exotic boutique, we began to feel like the chic sheik and sheika of our domain. Sorry, I couldn't resist it! Of course the true test of any hotel is, ultimately, service. The staff of The Five Graces is, in a word, fabulous. Friendly, always close by but never in the way. From the delicious breakfast served by excellent wait staff in the main courtyard to the wine and hors d'oeuvre served in your own courtyard every afternoon, the professionalism exhibited by every person at the inn is second to none. In addition, they know where everything is in Santa Fe. From the best eateries to the best galleries to the best day trips, no guide book is needed to enjoy all that Santa Fe and its eclectic environment has to offer. Just ask the concierge. They will have all the answers. Eat, Drink and Be Merry With Georgia O'Keeffe! One of the reasons Santa Fe is such an interesting place is its history. Native Americans built a settlement on the site that is today's central plaza around 900 AD. With a blend of many influences, including Native American, Spanish, Mexican and New World Settlers, Santa Fe is truly an exotic blend of cultures evidenced by its food, culture and architecture. At one point, it was even claimed as a part of Texas. With The Inn of The Five Graces as your base of operation, Santa Fe offers the Curious Nomad numerous opportunities for adventure, cultural discovery and sheer enjoyment of a truly unique place. To start with, the inn is only a couple of blocks from the main city plaza. The plaza is always busy with various vendors and local artisans selling their wares. 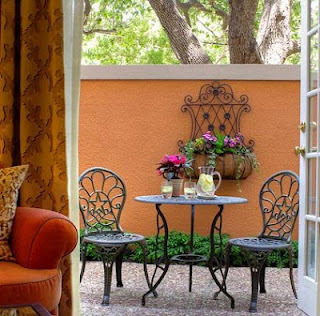 There are also numerous places to grab a snack and sit and enjoy the day. As you walk around the city, you have access to some of the best restaurants in the country that serve both local and international cuisine. The Anasazi Restaurant is a sure winner. Serving a blend of fusion and southwest, it is all good with excellent service. And if you are an art lover, Canyon Road is just a few minutes by foot. This area contains dozens of art galleries featuring some of the finest painting, sculpture and other creations that rival anything found in any big city gallery. One caveat - bring your wallet. These people are serious about their work. If you can't get enough of all that pricey artwork on Canyon Road, Santa Fe boasts a great museum featuring the works of one of the twentieth century's most important modern artists, The Georgia O'Keeffe Museum, just a few steps from the plaza. A darling of the New York art world long before women were recognized in the rarefied world of the art elite, O'Keeffe became one of the leading proponents and creators of the modern aesthetic. Her work produced while in New Mexico is know the world over. 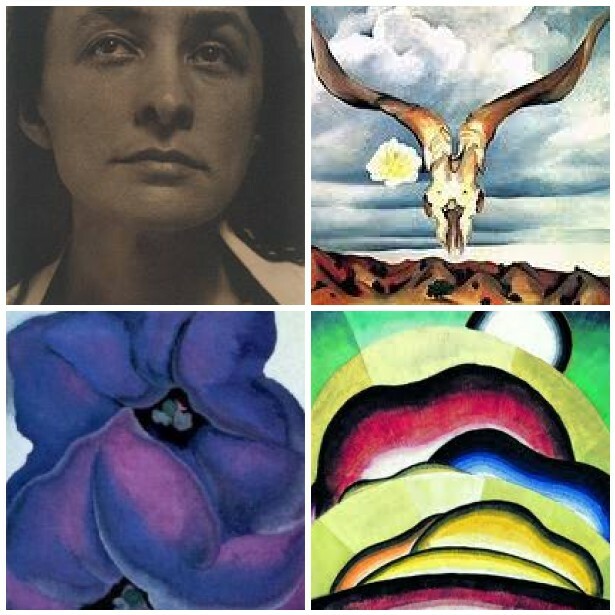 O'Keeffe is a must see while in Santa Fe. Because Santa Fe is at the center of interesting places, unparalleled natural beauty and some of the most innovative art studios anywhere, the world becomes your oyster, artistically speaking. One such place that is a must do day trip is the Shidoni Foundry & Galleries. Located about five miles outside of Santa Fe, Shidoni boasts an eight acre sculpture garden, an indoor gallery, the Shidoni metal foundry and the Tesuque Glassworks, where you can see artists in residence creating large and small works of bronze, steel and glass. We were fortunate to find an affordable piece that reminds me of the joys of being a Nomad in the magic land of the sun every time I see it on the shelf. And of course, no trip to Santa Fe would be complete without an all day visit to Taos. Take the High Road up to enjoy the history and amazing scenery. Plan to take about two hours each way, as you will want to stop often. The small high desert community (population 5,000) is another artists mecca for the Curious Nomad. 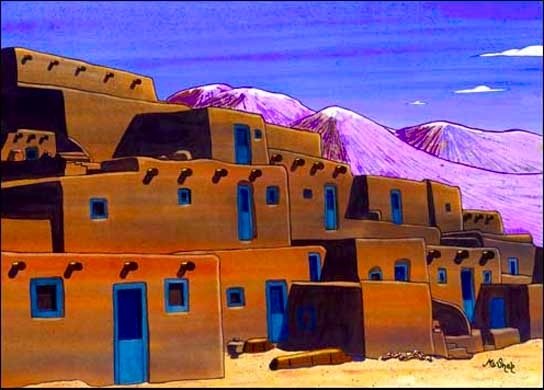 In addition, it has the Taos Pueblo, a thousand year old Pueblo community that will give you insight into the history and life of the earliest inhabitants of the ancient Southwest. The list of modern architects that have utilized the design motifs of the Pueblo is long and varied. After lunch at one of many local eateries, and more gallery ogling, the Low Road is recommended for your return to Santa Fe for more panoramas. Some say to take the Low Road to Taos and the High Road back to Santa Fe. Either way, its a great way to spend the day. And finally, for all Nomad Architects, The Loretto Chapel is an absolute must see. 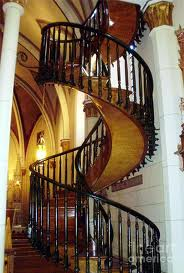 Just a few steps from the hotel, this former Roman Catholic Church is famous for its "Miraculous Stair", a wooden helix shaped spiral stair that has baffled architects and designers since it was constructed, allegedly, by French carpenter Francois-Jean "Frenchy" Rochas. Wikipedia states, however, that the Sisters of Loretto credit St. Joseph with its construction. Shrouded in mystery, this architectural construction, a wooden spiral stair with no central support, has developed a life of its own as to builder, designer. connection methods and source of materials used. So much so that an episode of Unsolved Mysteries finally declared that it was, in fact, built by Saint Joseph! So, if you want to see a slice of America that has been in our consciousness for decades through film, television, writing and art up close and personal, grab a Southwest flight to Albuquerque, hop in the car and plan to have sweet dreams with the one you love at The Inn of The Five Graces. Your senses will thank you and your significant other will forgive you for all those mean things you said to the kids. Video Artist of The Week - Rusted Root. Combining African, Latin, Native American and Indian influences with fusion, jazz and rock, this world music group combines insane percussion, great instrumentals and unique vocals that will get will get your mind right for The Land of Enchantment. Some years back, I had occasion to accompany my favorite traveling companion and muse to Dallas for a business conference. As an executive assistant, she got to pretty much run the show while I hung out around the very big Hilton somewhere downtown doing nothing, waiting for her conference to end. To be perfectly honest, I don't actually remember which Hilton it was, as I tend to block all Hiltons from my mind. All those big, over designed corporate spaces with miles of corridors to acres of conference rooms just isn't my cup of tea, But, it was the headquarters for the big business event my wife was attending and I got a clean bed and big shower for free. So whose complaining? Dallas is, first of all, very, very big. It is one of those cities that has grown exponentially and, at the time we were there, was awash in oil money and unbridled real estate development. Of course, as we all know, television really placed Dallas in the pop cultural consciousness of most Americans. JR and his cast of rich oil men, high rent grifters and near do wells projected all that we voyeuristic Americans love about soap operas. "Who Shot JR?" was one of the most compelling advertising slogans in the history of television, right up there with "Where's The Beef? or Coke-It's the Real Thing. Of course it didn't hurt that there was a hit TV show to go with the slogan. Admit it, you couldn't stand having to wait all summer to find out "Who done it". But I digress. staff and thoughtful amenities ensure absolute comfort. All true. And for a hotel that can boast that it is the only Forbes Four Star and AAA Five Star Hotel in Texas, the price is well worth it. With a staff that is never out of touch, yet never obvious, it makes one feel as if they have gone back in time to a great hotel of the past. Travel has become so "self serve" today. Not so at Turtle Creek. Like some throwback to a bygone era, you can even leave your shoes outside your door and they will be returned by morning, spit shined to perfection. Puttin' On The Ritz, Texas style! At Turtle Creek, they made me remember what my father always preached in his business - The customer is always right. Those are not just words at this magnificent property located just minutes from downtown. Of course, there is more to Dallas and The Mansion than just another pretty face. Dallas and Fort Worth are awash in many cultural opportunities for the Nomad who wants to get out more. If you are a shopaholic, then Dallas does, indeed , have it all. One particularly unique retail icon is just around the corner from the hotel, Highland Park Village. According to the Urban Land Institute, this high end "outdoor mall" is the "first planned shopping center in the United States with a unified architectural style and stores facing in toward an interior parking area, all built and managed under single ownership". With over a hundred boutiques from Anthropologie to Harry Winston you can max out your gold card with impunity. But don't spend all of your money, because you need to at least have the admission to visit two must see museums. First, the iconic Kimbell Art Museum, designed by one of the twentieth century's greatest architects, Louis I. Kahn, is one of the most compelling spacial compositions for displaying and viewing art. The introduction of natural light through vaulted light diffusers gives the elongated spaces a simplicity that could only be accomplished by an architect of Kahn's vision. These unique light elements, along with simple cladding materials for walls and floors, render spaces that enhance the experience of viewing great works of art. Another museum that any visit to Dallas/Fort Worth must include is The Amon Carter Museum in Fort Worth. Housing an extensive collection of paintings and sculpture by western artists Frederic Remington and Charles M. Russell, as well as other American artists, it is well worth the side trip to view some of the most compelling American art ever created. And It Wasn't Even On The Menu!! Of course no visit to Dallas would be complete without discussing what else? Food. Like all large cosmopolitan cities, Dallas has culinary offerings to suit every taste. 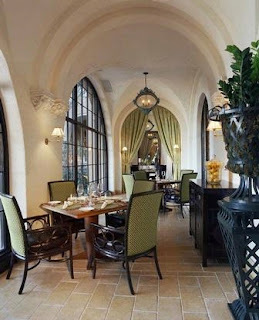 However, what makes a visit to Dallas a unique adventure for any Nomadic Foodie, is on site in the elegant Mansion Restaurant. I can personally vouch for their food - mind blowing, and their service - other worldly. This became most evident during a mid morning brunch. Prior to our trip, I had read about one of their signature southwestern dishes, Warm Lobster Tacos With Yellow Tomato Salsa. Not only had I read about this interesting dish, I had dreamed about it and discussed it at great length with myself and my bride. Imagine my dismay, my chagrin, my utter disillusionment when it did not appear on the menu! When I asked, with pleading eyes, why this particular dish was not on the menu, the waiter said with a congenial smile - "Don't worry sir, the chef will be happy to prepare the tacos as requested". Problem solved. Like I said, this is a whole 'nother place. And the chef did not disappoint. Every single morsel of this unique Texas dish was simply beyond description. A perfect meal, in a perfect room with the woman I loved before we met, made this Nomad glad he decided to drop anchor for a few days at this intimate little place in the heart of Big 'D'. Video Artist of The Week - The Little Willies led by Norah Jones, who grew up in Fort Worth. This unique group must be heard to be appreciated. The tune Fowl Owl On The Prowl gives you something to ponder next time you are daydreaming. Sorry for not posting last week. Due to some very bad water intrusion, we had to bail for a few days and put things back together. We got off pretty light based on the reports from other residents around the country far and wide. To celebrate Independence Day we usually go to a little piece of Heaven on Earth named Lake Blackshear near Warwick, Georgia to visit with family at my wife's aunt's place in an elegant home that sits on a peninsular with uninterrupted views of one of South Georgia's most beautiful waterways. The house itself is one of those places that they just don't build anymore. Low slung with wide eaves and lots of glass, it is a classic fifties ranch that combines modern design with well crafted details, traditional influences and comfortable furnishings. And of course, there is always the food. There simply is nothing quite like real southern food. Somehow it just makes people nicer and sleepy. As we were planning this little road trip with various family members, it occurred to me that the uniqueness of the celebration of our nation's independence brings together love of family and love of country like no other holiday we celebrate. It is precisely because, over two hundred years ago, men of incredible vision and bravery drew a metaphorical line in the sand and established The United States which has endured wars, economic upheaval and, at times, amazing political stupidity, to become the longest continuous government in history. Eldridge Gerry of Massachusetts: "I shall have a great advantage over you Mr.
by the solemnity with which the whole business was conducted." So what is the point and what does any of this have to do with travel for Nomads? The point- Because of the invention of Democracy in 1776, we are free to travel as we please and enjoy the incredible grandeur and beauty of this great country. In addition, the very act of rebellion founded in the words and the eventual fight for the new republic started something that has been responsible for more people being free the world over than any other single event in history. The next time you see a newscast showing some place in the world where women can't drive or people are persecuted because of their religious beliefs, it is imperative that you recognize that we are free because a group of "brilliant rebels" fulfilled "our" destiny with history through the greatest single document ever penned by humankind. So, in honor of this great day in our nation's history, I have reprinted the entire Declaration of Independence. I urge you to read it, make your kids read it and be thankful that we live in the greatest country on earth. Happy Fourth To Free Nomads Everywhere!!!! Video Artists of The Week - America The Beautiful by the one and only Ray Charles and other arrangements by various artists including Lee Greenwood and The Mormon Tabernacle Choir.